The end of the Troika financial services brand, founded by two Americans and one Armenian in the early 1990s, was signaled Monday as Moscow's largest brokerage and state-owned giant Sberbank announced the completion of their merger. Ten months after inking the $1 billion deal both sides saidTroika Dialogwill become part of Sberbank's corporate investment-banking, or CIB, arm under the overall direction of the company's corporate business director, Andrei Donskikh. The acquisition of Troika Dialog by Sberbank has given the country's biggest lender a leg-up in its push to carve out a presence in the investment-banking industry. But others have mourned the passing of an old brand with an international reputation. "Troika stood for an entrepreneurial Russia and a pugnacious voice in financial markets, and sadly that Troika will be no more," said Bernie Sucher, one of the three men behind Troika's rapid success in the 1990s and now a member of the board at Aton. The other two men were Peter Derby, who founded Dialog Bank in 1989, and Ruben Vardanian, a Yerevan-born graduate fresh out of Moscow State University. While Derby left Troika Dialog in 1997 and Sucher in 2002, Vardanian has remained chief executive and will continue in a leadership role under Sberbank. "Troika Dialog will not remain as a brand in the investment-banking business," Vardanian, 43, said in an interview published by Vedomosti on Monday. "If we want to develop the services offered by the Sberbank group, it's right that we are called Sberbank." 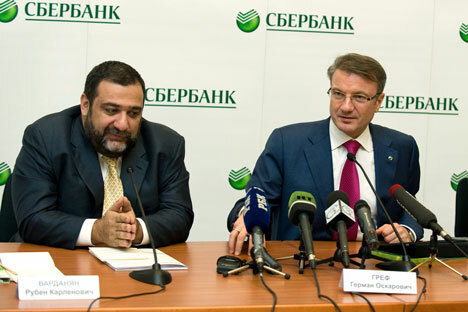 The CIB division of Sberbank will be co-led by Vardanian and Sberbank executive Alexander Bazarov. Sberbank's wealth management department, which will sell investment products to private clients and include asset management and private banking, will be headed by Vardanian and another Sberbank executive, Bella Zlatkis. Sucher said he first got involved with Troika Dialog after he met Vardanian in 1993. "For so many people in the 1990s, [Troika Dialog] was simply an island of stability and hope in a sea of chaos," Sucher said. "The ambition was to try and build a normal business in a normal country." The finalization of the Troika Dialog acquisition is a key step toward realizing Sberbank head German Gref's vision for the future of the former Soviet Union's monopolist savings bank. "The scale of our business is reaching a new level," he said in a statement Monday. But the swallowing of Troika Dialog is another confirmation of the growing power of state-owned banks in the Russian market. "This is the nationalization of the Russian finance industry, which was almost entirely foreign-controlled in the 1990s," Eric Kraus, a Moscow-based hedge fund manager told The Moscow Times. "The government has been encouraging the creation of two giant banking poles,VTBand Sberbank, to claw the business back from Western institutions," he said. "Troika was widely seen as a very Western institution." Kraus added that while big-name foreign investment banks would retain their share of big deals, mid-tier Russian operations including Renaissance Capital, Otkritieand Aton would continue to be squeezed. Vladimir Savov, head of equity research at Otkritie, said consolidation was ongoing in the Russian financial sector. "Clearly Sberbank wants to deliver the message that it is one house providing a whole array of banking services." Gref has defended Sberbank, which is 60.3 percent owned by the state, from accusations that it unfairly leverages its privileged position. "It's always like this: Success is explained by circumstance and failure by personal flops," he told Kommersant on Monday. "Success is [actually] created by people — not by brands and proximity to the state." Sberbank confirmed Monday that it had begun an intensive series of meetings with investors in London, New York and Boston. Analysts said the roadshow was designed to promote the bank ahead of an expected privatization of a 7.6 percent stake later in the year. Despite a steady flow of resignations from Troika Dialog since the takeover announcement, Vardanian has also defended the deal that, he said, has created significant opportunities for Moscow's oldest brokerage. Access to Sberbank's corporate clients will give Troika Dialog's business a big boost, Vardanian said. "There were people who, sitting in tanks, tried to fight with an aircraft carrier," he said, "but that pointless struggle has now ended."